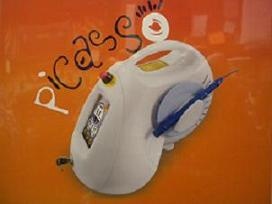 Introducing the Picasso dental diode soft tissue laser system. The Picasso laser is a surgical device at the cutting edge of technology, designed for a wide variety of oral soft tissue procedures. Picasso uses a solid state diode as a laser energy source. The energy is delivered to the operating area by means of a delivery system consisting of a flexible fiber connecting the laser source and the handpiece. Some of the dental procedures Picasso can be used for include: laser gum recontouring around teeth and dental implants; incisional and excisional tissue biopsies; frenectomy and frenotomy (removal or recontouring of muscle attachments that pull on the gums, leading to gum recession);incision and drainage of dental infections (abscesses); laser periodontal (gum) procedures to include removal of diseased or inflammed soft tissue in the periodontal pocket to improve health of the gum tissues. The Picasso laser can do these procedures in a less invasive and more comfortable manner than the older techniques previously used in dentistry. We are proud to be able to improve our patients' dental health with the addition of this new and very effective technology!